I was given this printer for free from HP but all opinions are my own. When I was in college this AMP printer would have been so clutch. Not only is it small and compact, prints wirelessly, it also has a built in Bluetooth Speaker. I would not have normally put these two things together but it's pretty genius. I keep it folded up in my living room console so I can quick print things I need to, and it doubles as a good living room speaker. I usually just move my beats pill from room to room but this is more convenient. The AP printer retails for $129 but is on sale for $79 at walmart right now. It has a USB port to charge your phone as well, and you can print wirelessly and effortlessly from a phone or computer. How clutch!? 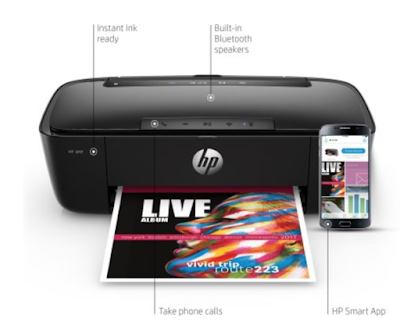 To set it up you download the HP app, and then you are good to go. This printer also takes calls but I haven't used that feature yet. I'm a fan. It folds so small, it's a millennial maven. Side note, I have been so obsessed with NERD Lemon for like the past month. After that listening party at complexcon I've been wondering when they will drop the album and they just announced it will be Dec 15th! The day after my birthday. It's going to be a good b-day week. SO MUCH BETTER THAN LAST YEAR. I also hope everyone had a Happy Thanksgiving! I decided to unplug this holiday, I am so tired of all of the gift guides with affiliate links galore and uncreative blog posts that are all over my social media. With that being said, blogmas is coming up. Get exited, a blog post EVERYDAY in the month of December until Christmas. I hope to bring different content than what is out there right now. It's getting really boring.